OEWG – What do you think about the May sessions? “Global Zero promotes the achievement of zero nuclear weapins by implementing an inclusive approach. To maintain the importance of this process it is necessary to bring back to the dialogue Russia and the USA. It will be impossible to reach global zero without cooperation of the main nuclear-armed states. It is crucial to establish multilateral forums to engage all countries in discussions, dialogue and negotiations in order to decrease military incidence, tension and risks”. 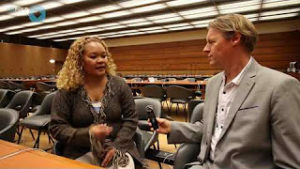 “Palau is passionate about subject of nuclear weapons. It is one of the first states to declare nuclear free constitution. In addition, Palau is part of regional nuclear weapon free zone. Palau is impacted by the two existential threats to humanity – climate change and nuclear weapons. We have been impacted by the nuclear tests in the Marshall Islands, and we have witnessed the much deeper suffering from neighboring Marshall Islands where the USA conducted the nuclear weapon tests”. 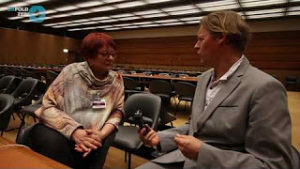 “The OEWG needs civil society actions in order to push for change. There will be a series of events around the world coordinated through Chain Reaction. They will start on July 8, the 20th anniversary of the International Court of Justice decision that the threat or use of nuclear weapons is generally illegal. 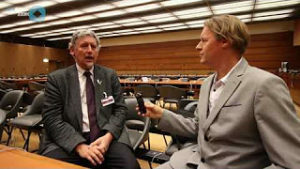 In Australia we are organising a Peoples’ Tribunal on Nuclear Weapons and the Destruction of Human Civilisation, which will challenge the leaders of the nuclear armed States and the allies for violating their legal obligations to achieve nuclear disarmament and not to threaten human extinction”. 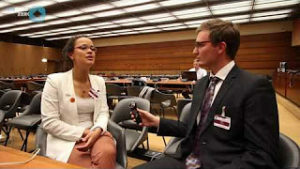 “Amplify is a recently launched network for youth leaders in the field of nuclear disarmament. During OEWG sessions Amplify presented a working paper on youth involvement in nuclear disarmament forums and supporting nuclear disarmament education programs ”. 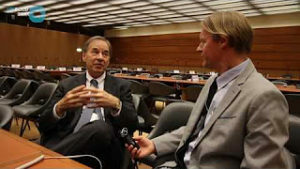 “The prohibition of nuclear weapons requires a multilateral agreement. A ban treaty might be a step towards a more comprehensive treaty establishing a world without nuclear weapon. Latin America and Caribbean states are committed to promoting peace and working actively towards nuclear free world. There is a need to devalue nuclear weapons and elevate the humanitarian concept. Civil society action is crucial in taking this message to the wider public in order to build support from political leaders of all countries”.